In today’s highly competitive business climate, the right type of branding and how it’s marketed is vital, and customers have come to expect innovation and fun from the brands and businesses they loyally follow online and off. This is where portable storage containers and business branding have begun to meet. Office Space Solutions: Whether your business is home-based, growing your current office is on your mind or expanding into other locations is in the cards, mobile storage units can help you increase your business reach without breaking the bank. Many business owners are using them to open up more space in their current locations and storing records and equipment. Some business owners have even been using mobile storage containers to store important assets as they set up more permanent office space or move offices. Seasonal Storage: Retailers, restaurateurs, and hotel owners have been using the mobile containers to manage their seasonal and surplus demand and store merchandise very efficiently and cost-effectively. Some retailers, in particular, have taken advantage of their storage containers and have held seasonal sales inside of them to make room for the next round of merchandise they need to store inside of them. If you’d like to employ portable containers as part of your business branding strategy, then make sure your storage unit is one of the more interesting, inviting and cheerful features of the local landscape. A.B. Richards, the leading supplier of ground-level storage containers in the Northeast since 1982, can help you get started. 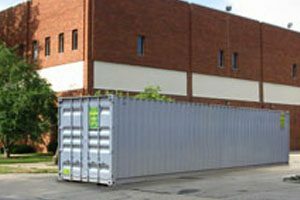 Contact our storage container experts today at (800) 597-5971 to learn more about our storage container renting and leasing options for our weatherproof, fireproof, sturdy, stainless steel storage units.